Pinoy Pride 36: A Legend in the Making to be held in Bacolod on May 28th, 2016. This event will be the 36th edition of Pinoy Pride Series of ALA Promotions. Pinoy Pride 36 headlines Donnie Nietes, Arthur Villanueva and Milan Melindo. Nietes is scheduled to fight on this event against "yet to be known opponent". 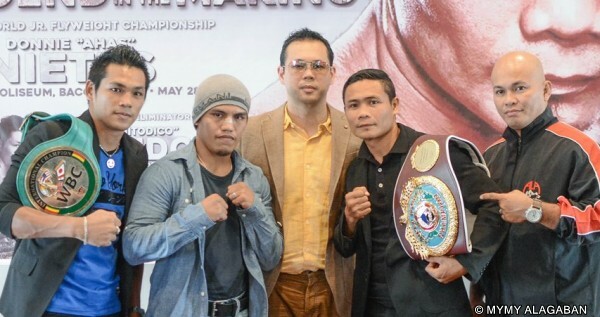 Milan Melindo will get his rematch against the former IBF Jr. Flyweight champion Javier ‘Cobra’ Mendoza of Mexico. This fight is also an IBF Jr. Flyweight Eliminator. While Arthur Villaneva will comeback to face Juan ‘El Penita’ Jimenez of Mexico for a 10-round non title fight. Pinoy Pride Series is a successful boxing event in the Philippines and already had 35th edition and becoming successful not only in locally but internationally.